I am recovering from a spell of late-afternoon heatstroke, as it was a gubzillion degrees out today and I had a massive round of grocery shopping to do in order to prepare for a little dinner party that I’m having for friends tomorrow night. Although sometimes, in my head, I secretly envision myself jauntily tramping through tropical rain forests on a thrilling Insect Safari, the sad truth of the matter is that I have a very low tolerance for heat and humidity. Okay . . . I have practically no tolerance for heat and humidity. First I get irrational and cranky. And then I just get plain mean. Mean, mean, mean. The menu for my dinner party tomorrow night is, I’m afraid, schizophrenically eclectic. I’m not exactly sure what happened here. I mean, I do actually know how to assemble a menu that actually goes together . . . I’m not total moron, but something just ran amok along the way. I’m going to choose to blame it on late afternoon heatstroke brought on by the aforementioned gubzillion-degree weather. So, the upshot is that I will be serving a salad with fresh spring greens, honey-glazed almonds, and a balsamic vinaigrette; a Greek barley salad with red and yellow peppers, olives, cucumbers, and Feta cheese; a multicolor pasta thingy tossed with diced tomatoes, onions, garlic, peas, thin slivers of prosciutto ham and sprinkled with grated Romano cheese; salmon marinated in an orange ginger glaze; and a white chocolate raspberry cheesecake for dessert. So, okay . 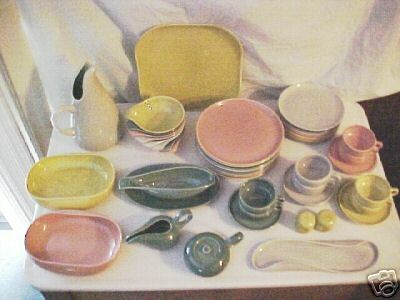 . . a schizophrenically eclectic menu, but the fun part will be getting to use my delightfully retro, most definitively mid-century modern Russel Wright dinnerware. I had the amazing luck to have a poem accepted by BLOOM Magazine today, and I’m over the moon with joy as I have been secretly yearning to be in BLOOM since it first came out! My cat Yuki has a new early morning game that she likes to play. It entails locating one of her smaller-sized crackly cat toys, for starters, and then batting it around on the floor for a bit and carrying it around . . . just to get warmed up. Then, when she’s through warming up, and when she’s also sure that I’m fully engrossed at the computer with my first large mug of coffee, she charges the laptop table, leaping up by the computer, crackly cat toy in her mouth, and then slam-dunks said cat toy into my large mug of coffee with a triumphant splash. (At this point, the choice of the smaller-sized crackly cat toy has now become disconcertingly clear: it has obviously been selected because it is the size of cat toy that will actually fit within the opening of the large coffee mug.) Having slam-dunked her cat toy into my coffee, Yuki then immediately lets out one of those throaty, loud Siamese yowlps. She is without a doubt, at this juncture, extremely pleased with her bad self. These morning WNBA-style shenanigans, however, can clearly take it out of a girl. Afterwards, fierce and gratuitous napping is frequently in order. 1. Don’t make me get up. Hey . . . ! Don’t MAKE me get up!! Are you really gonna make me get up? Look at me . . . yeah, that’s right, I’m getting up, missy! 2. Hey . . . where did you . . . that’s MY scrubby thingy. That’s not a toy, mister! You give that back! 3. I’ve said it before, and I’ll say it again, nobody likes a pig licker. Hey, pssst . . . over here. In some sort of bizarre, From the Test Kitchens of Good Housekeeping-esque frenzy, I have been compulsively trying out recipes for different types of barley salad. Yes, that’s right. You heard me. Barley salad. Do you want to make something of that? Here’s the thing. I really, really like barley. I find it exceedingly satisfying: comforting, wholesomely nutritious, yet mildly eccentric. Slightly original, even. Yes, not everyone dares to take the barley road. It’s like okra, in that regard. Or brussel sprouts, for that matter. During the winter, I love to cook up large pots of soup that are just chock full of barley, and so the idea that one could also eat barley during the summer in the form of barley salads struck me as being sheer genius! In the past week alone I have made (and slightly tweaked) recipes for Herbed Barley Salad, Greek Barley Salad, and Lemon Mint Barley Salad, all of which have been utterly dazzling in their Wholesome Barley Goodness! The other thing about barley? You can eat it with a spoon while cryptically intoning “Garmonbozia! Garmonboooozia!” a la David Lynch’s Twin Peaks. It is, I think, the definitive foodstuff for this particular activity. Now folks, I wouldn’t recommend trying this at home in front of other people because they will, trust me, only think that you are a dork. If you are by yourself, however, or preferably in the presence of quizzical cats and dogs, you will undoubtedly find yourself to be unspeakably hilarious. 1. Because I spent most of the month of May relocating to marvelous New Digs in Meat Space, it only seemed appropriate that I relinquish my old address in Virtual Space as well. I think that I arrived at a point where I simply couldn’t stand the sight of my own blog any longer. 2. The New Digs are marvelously marvelous, with a working firelace (hooray! ), and French doors (hooray! ), and a built-in china cabinet (huzzahs! ), and a claw-foot bathtub! I had despaired of ever finding this sort of apartment here, but now I have, and I’m happy beyond all comprehension. 3. 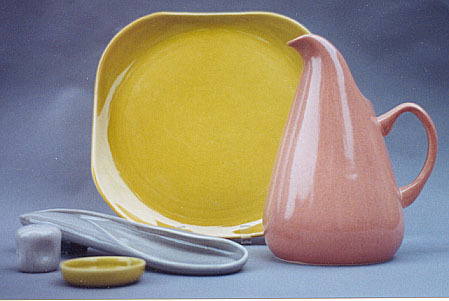 Russel Wright mid-century modern table ware is the shizz-nit. 4. That would now be, by the way, Associate Professor Artichoke Heart to you!